But will it drive innovation for the long haul? Some of us old enough to remember the 1980s know that Tesla used to be a hair-metal band. Others who paid attention in history class know that Telsa was, in the 1880s, the Serbian-American engineer who invented the polyphase AC generator—the motor that later allowed George Westinghouse to bring electricity into American homes. Tesla's cars have only been on the market since 2008. Yet in that time, they've single-handedly changed long-held perceptions about electric vehicles as clunky, low-range tortoises into visions of James Bond-style and performance. MSN has called Tesla "sensational." London's Telegraph called it a car that will change the world. And cartoonist and web celeb Matt "The Oatmeal" Inman famously termed his Tesla Model S "an intergalactic space boat of light and wonder." And, no kidding, the cars are fast. But there's something else at work here­—not just a leap of technology, but one of branding. Because the fact is (the 0-to-60 in 2.8-second acceleration aside) Tesla's performance as a company is a wee less impressive than the road tests. Tesla kept customers waiting three years before its Model X hit the market. The brand's early glowing reviews have dimmed amid disturbing reports of broken parts and software crashes. And while Tesla's revenue is growing, it was still $320 million in the red for Q4 2015. So why all the praise—especially since Tesla's hardly the only brand making electric cars? After all, companies like Chevrolet, Nissan and Ford are also making them. "But they don't have the cachet of Tesla," observed automotive guru Paul Eisenstein, publisher of The Detroit Bureau, "and Elon Musk is a major reason for that cachet." Ah yes, Mr. Musk—billionaire brain behind PayPal and the founder of SpaceX (and No. 72 on Adweek's Power List). With his future-focused vision, turbocharged ego and spacious bank account, Musk may just be more valuable to Tesla than the lithium-ion battery. American business is rife with examples of companies whose popularity stems in large part from the personalities behind them (Steve Jobs and Apple, anyone? ), and Tesla seems to be another example. Though Tesla's inaugural vehicles (whose prices easily tickled six figures) were largely seen as "sports cars for rich people," to quote Musk himself, the CEO has a "master plan for getting to compelling and affordable electric vehicles." The Tesla Model 3, promised for late 2017, will cost only $35,000. Which, said, Eisenstein, is a good thing—though Tesla has plenty more ground to cover. "Musk has developed the cult of Elon," he noted. "But at some point that has to give way to a cult of good quality." "The strategy of Tesla," Musk said in 2006, "is to enter at the high end of the market where customers are prepared to pay a premium, and then drive down market as fast as possible to higher unit volume and lower prices with each successive model." 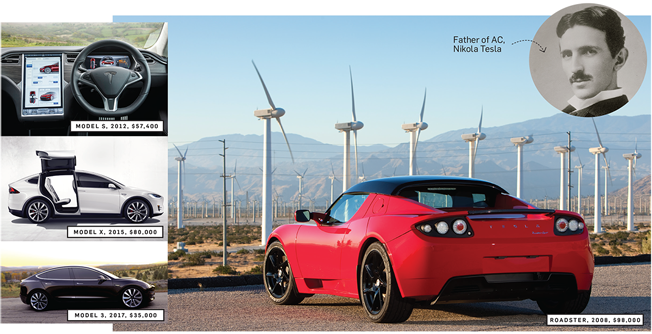 Starting with the 2008 Roadster, that strategy has played out—more or less—with the models above.